I’ve spent most of the last week with colleagues at the International Conference for the Fantastic in the Arts, which involved basking by the pool in the balmy Florida weather, enjoying the hospitality of the hotel bar, and a number of excursions to local restaurants. I believe some mention was now and again made of science fiction, but my memory on that point is hazy. I have returned with no less than thirteen mosquito bites on the triceps area of my left arm. I don’t know if it was a swarm hitting me all at once, or one overambitious mosquito with a ravenous appetite. In any case, it’s clear that mosquitos in that vicinity have stealth technology. If I come down with dengue fever, I’ll be sure to let you know. But lo! 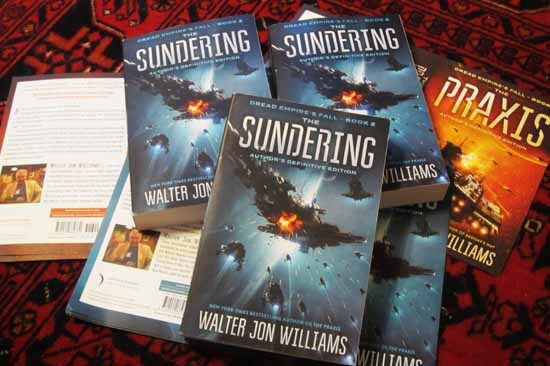 I have returned to find a great big package of books awaiting me, including the very handsome new trade paperback of The Sundering, which means it will arrive in stores any instant now. This is, once again, the Author’s Definitive Edition, and with no modesty whatever I recommend it highly. Looks like I might have to replace my old worn copies of the series.